According to published data, about one in four emergency physicians (EPs) and nurses report that they were victims of physical assault in the past year. A recent study found that as many as 78% of EPs reported at least one act of physical or verbal aggression in the previous year, and 21% reported more than one episode. Another analysis revealed that before completion of training, more than 50% of emergency medicine residents had been physically hit or pushed by patients. Fear of assault or being shot was their second-leading concern, trailing only needlestick injuries from patients with HIV. Several organizations, most notably the Occupational Safety and Health Administration (OSHA), have recently issued a call to action to improve initiatives aimed at preventing violence in healthcare settings. In the Journal of Emergency Medicine, Dr. Kowalenko and colleagues had an analysis published that reviewed ED workplace violence in the context of risk factors for WPV. 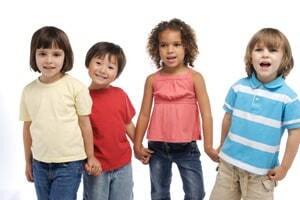 The study also reviewed current concepts for interventions designed to prevent WPV in the ED. OSHA recommends that a WPV prevention program has committed support from management and conducts worksite analyses specific to the environment. The worksite analyses should then be used to develop site-specific interventions. “These components are not specific to the ED, but they can serve as a starting place for ED leaders to address this critical problem at their site,” adds Dr. Kowalenko. The second step is to complete a work-site-specific analysis of the ED. This involves conducting an assessment of risk factors for violence in the ED, including the number of psychiatric and substance use patients who are treated each year in the ED and the number of patients who are victims of violence with potential for in-unit retaliation (eg, gang violence). Assessing staffing ratios and the prevalence of handguns and weapons in the community is also important. Risk factors that are part of the environmental design of the hospital, such as poorly lit corridors, rooms, and parking lots, should also be considered. Kowalenko T, Cunningham R, Sachs CJ, et al. Workplace violence in emergency medicine: current knowledge and future directions. J Emerg Med. 2012;43:523-531. Available at: http://linkinghub.elsevier.com/retrieve/pii/S0736-4679(12)00350-2. Gates D, Gillespie G, Smith C, et al. Using action research to plan a violence prevention program for emergency departments. J Emerg Nurs. 2011;37:32-39. Anderson L, Fitzgerald M, Luck L. An integrative literature review of interventions to reduce violence against ED nurses. J Clin Nurs. 2010;19:2520-2530. Kowalenko T, Walters BL, Khare RK, Compton S. Workplace violence: a survey of emergency physicians in the state of Michigan. Ann Emerg Med. 2005;46:142-147. Gacki-Smith J, Juarez AM, Boyett L, et al. Violence against nurses working in US emergency departments. J Nurs Adm. 2009;39:340-349. American College of Emergency Physicians (ACEP) Board of Directors. 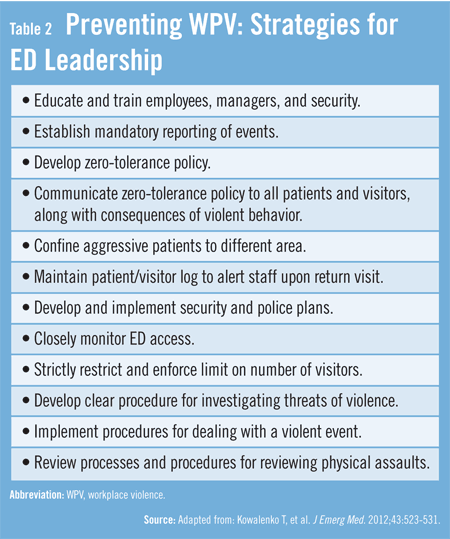 Protection from physical violence in the Emergency Department environment. ACEP Website. Available at: http://www.acep.org/practres.aspx?id=29654. Emergency Nurses Association. Position statement: violence in the emergency care setting. Emergency Nurses Association Website. Available at: http://www.ena.org/SiteCollectionDocuments/Position%20Statements/Violence_in_the_Emergency_Care_Setting_-_ENA_PS.pdf. Kansagra SM, Rao SR, Sullivan AF, et al. A survey of workplace violence across 65 US emergency departments. Acad Emerg Med. 2008;15:1268-1274. Terry Kowalenko, MD, has indicated to Physician’s Weekly that he has no financial disclosures to report. I have a concealed weapon permit and carry all the time. I will not be a victim in or out of the hospital. I don’t think the CEO or $7 per hour security guard will be jumping in front of gunfire or a knife trying to protect me. Nor will the $10 per hour 110 pound ward clerk. Unless hospitals have permanently placed officers (preferably police) in the ED and throughout the hospital, all hospital personnel are at risk of gun and other violence.